Inebriated reporters spying on athletes and politicians from behind office drapery, beneath mattress pads and under gum wrappers say that Olympic swimmer and 14-time Olympic Medalist Michael Phelps, was framed. According to reports assembled by our Editor during a late night of heavy cigar smoking with only occasional breaks for Crown Royal, the entire marijuana bong thing was a set-up orchestrated by out-of-work Republicans bent on no good. 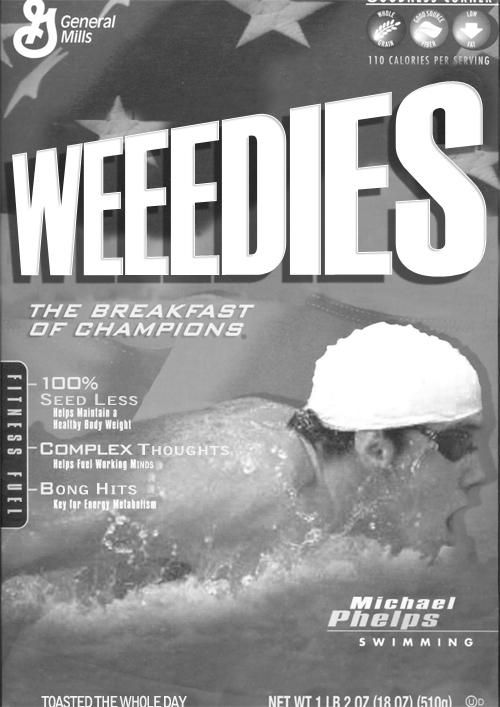 ABC News reported that USA Swimming has suspended the Olympian for three months and the Kellogg cereal company said that they were ending their endorsement deal with him when it’s up for renewal at the end of February. But all is not lost. Nike and Speedo don’t care and word on the street is that White Castle is interested in signing him to an endorsement deal. According to Brand Weak, an underground public relations firm, the framing of Phelps can be turned into a positive. In other news, Inebriated reporters say Barry Bonds and Roger Clemens are both innocent too and should be left alone. Unless they want to declare themselves drug users and sign-up with Brand Weak for muscle enhancement endorsements. Each to his own as they say. It’s all a matter of perspective.